After the attack, CNN takes measures to detect Open Redirect vulnerabilities. The measure is quite good during the tests. Almost no links are vulnerable to Open Redirect attack on CNN's website, now. It takes long time to find a new Open Redirect vulnerability that is un-patched on its website. 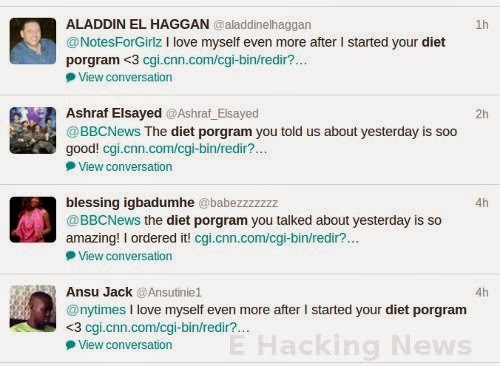 <1> "The tweet apparently shows cyber criminals managed to leverage the open redirect security flaw in the CNN to redirect twitter users to the Diet spam websites." The programming code flaw occurs at "event.ng" page with "&Redirect" parameter, i.e. From OWASP, an open redirect is an application that takes a parameter and redirects a user to the parameter value without any validation. This vulnerability is used in phishing attacks to get users to visit malicious sites without realizing it. This could allow a user to create a specially crafted URL, that if clicked, would redirect a victim from the intended legitimate web site to an arbitrary web site of the attacker's choosing. Such attacks are useful as the crafted URL initially appear to be a web page of a trusted site. This could be leveraged to direct an unsuspecting user to a web page containing attacks that target client side software such as a web browser or document rendering programs. The redirected webpage address is "http://webcabinet.tumblr.com/". Suppose that this webpage is malicious. 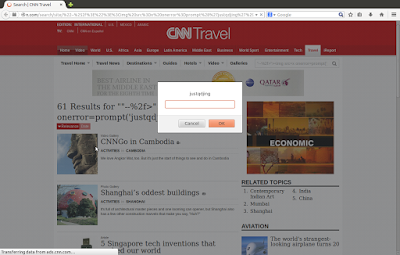 Since CNN is well-known worldwide, this vulnerability can be used to do "Covert Redirect" attacks to other websites.